If you think about it, Buy Low, Sell High is the secret to investing. Logically, it’s tough for anyone to refute that statement. So why is it so hard to do? It’s simply because psychology gets in the way. I’ve said many times that when it comes to money, psychology is more powerful than logic. Psychologically, we think we can time the peaks and valley’s but really we can't. If you buy something for $1.00 and it goes up to $1.25, did you make money? What if you bought something at $1.50 and it goes to $2.50, did you make money? What if you bought at $3.00 and it goes up to $4.00 and you sell it but it keeps going up to $4.50? Are you happy that you made money or are you upset that you sold too early? In my experience I hear people talk about the opportunities missed all the time because they bought too early or sold too late, when they should focus more on the fact that they made money. Investors need to stop trying to hit the top and bottom of market movements. I hate to break it to you but it’s just impossible to do on a consistent basis. If you’ve done it, it probably was due to luck than the ability to predict it with any degree of accuracy. What does your gut instinct tell you to do? 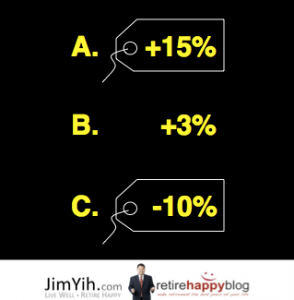 For most people, the natural instinct is to turf the loser (Investment C) and keep the winners (Investment A and B). If you do this, you are in fact practicing the wrong strategy: SELL HIGH, BUY LOW. What is happening here is something called linear extrapolation. We tend to think in straight lines. When investments go up, we think they will keep going up. When investments are winners, we think they will always be winners. When investments go down, our biggest fear is they will keep going down. No one wants a loser so we assume the trend might continue and want out. Which commodity would you buy? You see if these were price tags were attached to toilet paper, ipads, shoes or couches, we would choose the one that is 10% off because we are conditioned to buy on sale. Maybe we need trick our brains buy drawing price tags around performance figures to help us BUY LOW, SELL HIGH. Let’s imagine these three investments as a portfolio. Rebalancing forces us to BUY LOW, SELL HIGH without guessing, forecasting, predicting or speculating. Rebalancing is a disciplined strategy that increases returns and takes the guesswork out of investing. What do you think of this logic? ← Charitable Giving Using Life Insurance. What do I think about this logic? I think rebalancing is the very definition of “buy low sell high”. If you’re buying and selling financial instruments on anything other than that then you’re pretty much guaranteeing that you’re going to buy high and sell low. When equities (or generally, mutual funds) go high, take some of that money and put it into bonds. that’s hard, everyone’s earning 12% and talking about how great they’re doing, and you’re taking money out of those investments and putting them into low performers. Then when markets crash, you’re moving money from nice safe bonds over into equities that just crashed. That’s really hard to do to. But if you buy when the markets are down, and sell when the markets are high then, yeah, that’s buying low and selling high.